The reason is trivial: I am a fan of the "Word of the Day" screen saver and I would like to add dictionaries for languages other than English and Japanese (these are the two that I can select now in screen saver options). It is a list of tab-separated entries. On the right you have the word, and on the left, what looks like an ID. But what's it an ID for, and how would you be able to find it for another word not already on the list? How to find the IDs for other words? Notice that id param... it's an identifier that looks exactly like the one in the screensaver word list! When I replaced the original screensaver file with this new one, it worked. You can now have a "Word of the Day" screensaver that gives definitions for the words you choose. I also tried restarting after enabling the dictionaries. In case anyone is still interested in this in 2018 and come across this.. I just updated to OS X Mojave, and found a Word of the Day.saver file at /System/Library/Screen Savers/. In this package, go to Contents/Resources/WordLists/, and you can find the 5 .plist files used in the Mojave WotD (they added three Mandarin/Cantonese Chinese dictionaries). There you can use jsomers's method above. Also it's been a while since Apple added the System Integrity Protection to the OS X, so you will have to disable it before writing to the .plist file. I'm quite happy that Apple haven't given up on the good old WotD, and updated it a little in Mojave. Hope they can provide even more dictionary choices in the future. Not the answer you're looking for? Browse other questions tagged macos screensaver dictionary . 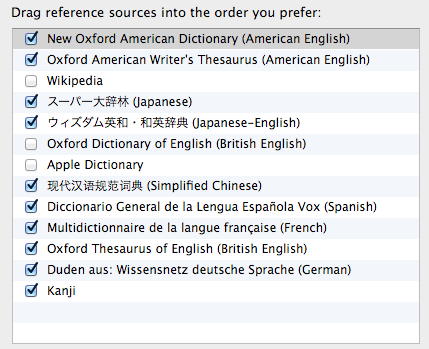 What is the difference between the variant language dictionaries in OS X? Where are the system spellchecking dictionaries? How do I use spell check in OSX with several languages? Where can I find *all* screensaver files on MacOS Sierra?